From the Hancock County Courthouse, take Hwy 22 southwest for 7.2 miles to Devereux. Turn right (at the backward fork) onto Main Street. Go 0.2 mile to the dead end with Jones Chapel (to the left) and Glen Ford / Hall Chapel Rd. (to the right). Turn left on Jones Chapel and go 1.3 miles to Warren Chapel Road. Turn right on Warren Chapel Road and go 1.3 miles to 919 Warren Chapel Road to a driveway going into the property of Ruth Davis (33 14' 16.9" N 83 06' 11.7" W). Proceed to the house. The cemetery is behind the house to the right and back into the woods. 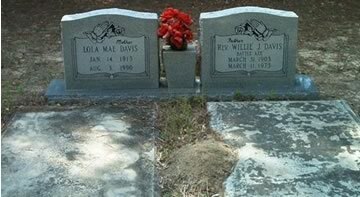 "Mother" Shares same headstone with Willie J. Davis.